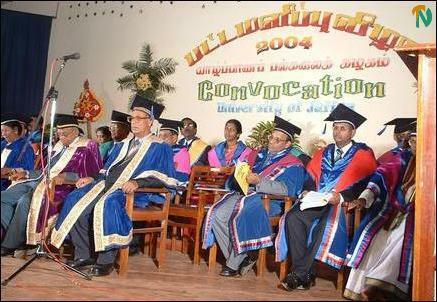 The Jaffna University created history last weekend by conferring Honorary Doctorates of Philosophy posthumously on two world-renowned artistes, Nathaswaram Vidwan Mr. N.K.Pathmanathan of Alaveddy and Dramatist Nadikamani V. V.Vairamuthu of Kankesanthurai. The Chancellor Professor M.Sivasooriya conferred the titles on them at the twenty-third convocation of the university held Saturday at the Kailasapathy Auditorium. Relatives of the deceased artistes accepted the titles, sources said. Professor S.K.Sitrampalam, Dean of the Post Graduates Faculty delivered the introductory address on the recipient Alaveddy N.K.Pathmanathan and Professor P.Gopalakrishnan Ayer on Nadikamani V.V.Vairamuthu, sources said. Mr. N.K.Pathmanathan was born in 1932 at Alaveddy north in Jaffna. His father, late Mr.Kanthasamy was a leading Thavil (Drum) Vidwan in early days. Mr.Pathmanathan studied Nathaswaram music under his father. Thereafter he became a student of another Nathaswaram Vidwan Kondavil Mr.M.P.M.Thirunavukkarasu. He held his Nathaswaram recitals in many parts of the world including London, Germany, France, Singapore, Malaysia, Canada, Australia and India. He was conferred with the title "Nathaswaram Isai Chakravarthi" (Emperor of Nathaswaram Music) by several musical organizations. He was holding the post of Asthana Nathaswaram Vidwan of the historic Nallur Kandasamy Temple for over forty-one years. Recognizing his contribution to the development of Nathaswaram music, the Government of Sri Lanka conferred on him the title "Kalasuri". He was the first Nathaswaram Vidwan who was conferred with the State Award, sources said. "Nadikamani" Vairamuthu was born on 11th February 1924 in Kankesanthurai. 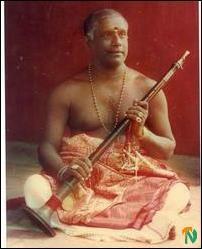 He learnt Carnatic music under the able guidance of Vidwan Chellapapillai in Madurai from 1941 to 1942. He became a Tamil Pundit passing Pundit examination held by Madurai Tamil Sangam. He underwent training in Madurai in Tamil theatre under the guidance of Mr.Karunalaya Bagavathar. He returned to Jaffna as a well-qualified musician and theatre artiste. Mr.Vairamuthu staged several Tamil plays and became an exponent in producing Tamil plays based on Tamil literature. His play “Mayana Kandam” is still remembered in the Tamil literary world as a masterpiece. This play was staged more than three thousand times due to repeated requests from the Tamil activists. 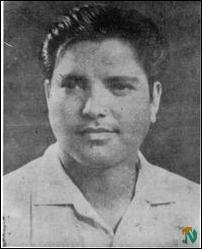 The title “Nadikamani” was conferred on him for the success he achieved in Tamil theater. He began his career as a teacher but later resigned from the profession and dedicated himself completely for the development of Tamil theater. The title “ Nadaka Chakravarthi” was conferred on Mr. Vairamuthu by late professor S.Vithiyananthan in 1982 at an event in Colombo when he staged his masterpiece “Mayana Kandam” for the 2501st time.